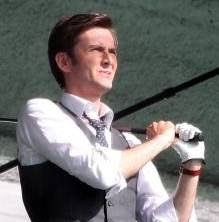 David Tennant completed filming the pilot for a potential series for NBC called Rex Is Not Your Lawyer just before Christmas 2009. David Tennant played Rex, a Chicago litigator who becomes so crippled by anxiety that he takes to coaching his clients into representing themselves. David has described this as a "comedy drama". Unfortunately on Sunday 16th May 2010 it was announced that NBC would not be making a full series of Rex Is Not Your Lawyer. Unlike UK television, the US have a policy of announcing that they are making pilots for series. A decision on whether or not it will ever air is made by the network after the pilot is complete. If Rex was picked up, the earliest it would probably have aired would have been next Autumn but there was also the chance that they could have picked it up as a mid-season show (meaning they like it enough to fund episodes but don't have room on their schedule, so then they would have held it in reserve until a slot opened up.) If that was the case, then it would not have aired until Spring 2011. If a series was made then NBC would have had an option on David playing the lead in the series too which limited any other roles that he could undertake at the beginning of this year until NBC had decided whether or not they woul exercise their option. Shooting of the pilot is believed to have started during the week commencing 23rd November and finished on Tuesday 22nd December (although David was required all that time). For posts related to Rex Is Not Your Lawyer on Blogger.com click here. At the NBC Executive Session of the Television Critics Association Winter Tour today they announced that (as expected) starting 12th February the Jay Leno Show will no longer air at 10pm. Of interest to David Tennant's fans was whether Rex Is Not Your Lawyer would replace that slot on at least one day of the week. However they announced that television executives will view the pilot tomorrow (Monday) evening and a decision will be made then. @televisionary: "Asked about what's coming up Rex is Not Your Lawyer could "theoretically" be ready or it could be an early fall pilot." @EricIGN: "Theoretically" Rex is Not Your Lawyer (with David Tennant) could air this spring on NBC. Pilot is done." @televisionary: Gaspin said he is "not sure" if Rex or other contenders will make it on the schedule. Too soon to make any announcements. @televisionary: Execs will watch cut of Rex is Not Your Lawyer this week. Could be on air this season via fast-track but not yet ordered. @KateOH: " Angela Bromstad said that the pilot Rex Is Not Your Lawyer with David Tennant will be ready for exec viewing tomorrow." About David Tennant's American accent - "It was great. The guy next to me didn't realize David was putting on an accent. I got to see the panic attack, so cool which is the 1st part." "It was a long filming day, I was there for 15 hours. David had to have so many panic attacks in an really hot "courtroom". My best extra job ever." "Our (extras) handler said that it looks like the series will be picked up so full production could start in a few weeks."